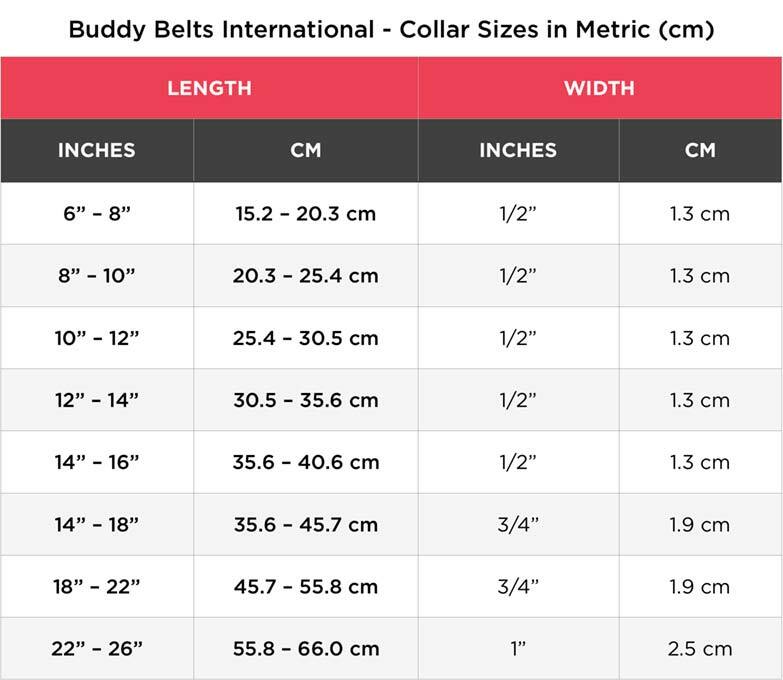 Inspired by a little Dachshund named Buddy and handcrafted in Canada, the Buddy Belts ID Collars are made to match Buddy Belt’s sturdy yet fashionable soft leather harnesses. Allowing you to hang your dog’s ID tags or anti-flea charms, it is a perfect complement to the Buddy Belts harnesses in terms of both practicality and fashion! Quality workmanship and care are engineered into every Buddy Belt product. 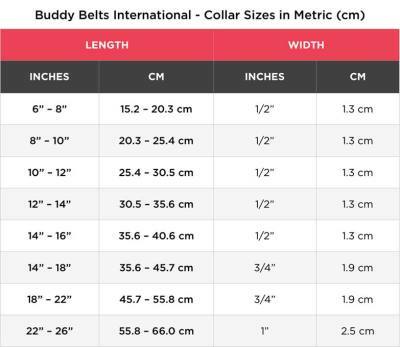 Buddy Belts are handmade in Canada, and have been thoroughly tried and tested to ensure that the materials used are of the best quality. 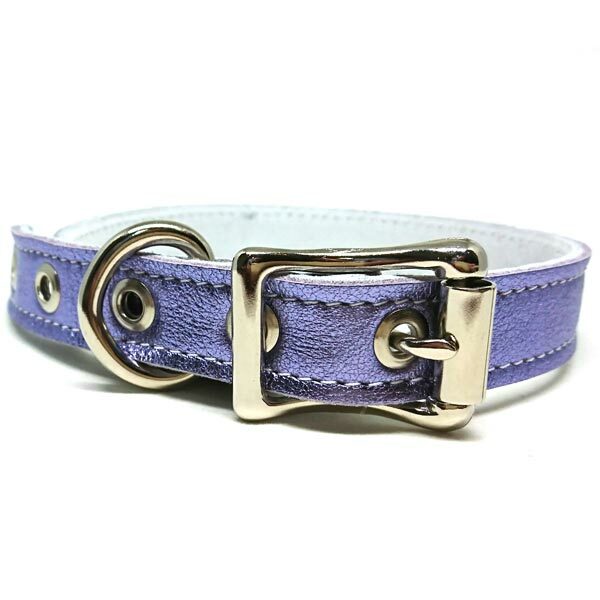 The product picture features the Buddy Belt ID Collar with a 3/4-inch width. 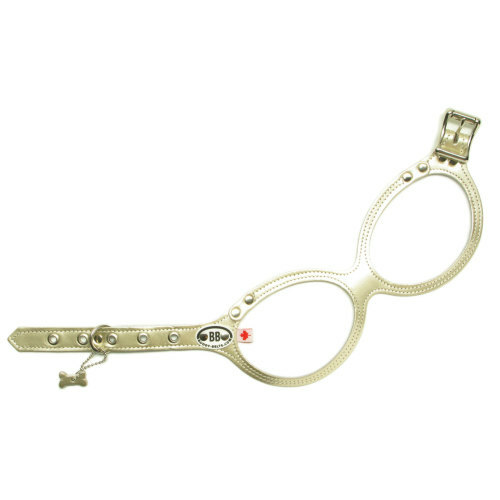 The length indicates the distance between the loosest & tightest adjustment eyelets. Be sure that there is extra room for comfort between the collar and your dog’s neck when worn. It is strongly recommended by the maker that you supervise and closely monitor your dog when first using the Buddy Belt ID Collar, until it has become accustomed to the product. 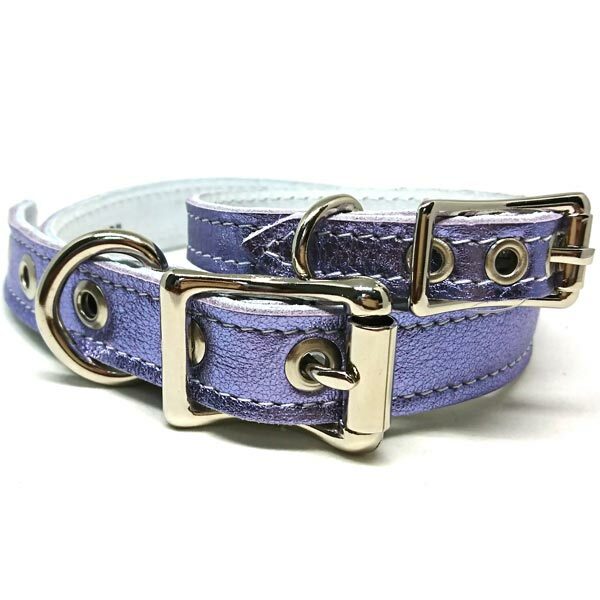 Store your Buddy Belt ID Collar out of your dog’s reach, to prevent your dog from chewing on the collar. Measure your dog’s chest circumference. You want a snug measurement, directly behind your pet’s front legs. Select the correct size using the size chart. An ideal fit will allow enough room for 1-2 fingers under the strap. The harness should fit snug against your dog’s body. If it fits on the tightest (first) hole, try a size smaller. It’s better to be on the last hole, than to have a loose fitting harness. The harness may stretch to fit one hole smaller as it forms to your dog’s chest. Place the harness on ground, coloured side down. The buckle always goes to your dog’s left paw. Step in the harness and fasten the buckle. Attach your leash to the ring and have fun! All leather Buddy Belts harnesses purchased from Magasin Miyabi Pte. Ltd. are covered by the manufacturer’s limited lifetime warranty on any manufacturing or hardware defects (excluding wear and tear). Exchanges and returns of Buddy Belts products are governed by Section 8 of our Terms and Conditions. Shipping costs within and without Singapore for exchanges, returns and warranty claims are to be paid for by the customer. Other harnesses were awkward to put on and uncomfortable to wear. With the BB Sophia does not even seem to notice she is wearing it, which makes training and going for a walks way more enjoyable for the both of us. I have also noticed that she moves more freely since the BB does not restrain her at all. Due to its proper fit, I also feel safe leaving her alone while wearing it. Great product!! Just thought I would let you know that you have yet again made me a satisfied customer. Oreo (Boston Terrier) is on his 2nd BB and loves it. He doesn’t pull, he pays more attention to the walker, and his eyes aren’t as red as they were. He wears the BB all day and it’s only taken off at night. Thank you for an amazing product! I bought a Buddy Belt for my Bichon. It saved his life last night. A German Shepard attacked him- bit into his back- and because I could lift him in the harness and swing him in the air away, the other dog let go and I could then pick my dog into my arms and run. A collar on my dog could never have done that. So thank you. He is one sick dog after surgery but I believe he will live because of the harness and the fact that it cradles the dog. Best $100 I ever spent! My Buddy Belt arrived today and it fits perfectly. The colour is “tres fabu”, very this season! I’m particularly taken with the chaffing liner! Such a simple solution but what high quality for a secondary item! Amazing! I have to commend you on your product; it by far exceeds my imagination. I feel a little spoiled here in Paris, one becomes accustomed to the French style and Italian workmanship in leather goods but I have to say your product is definitely on par. Congratulations! I originally bought a Buddy Belt for my 7lb toy poodle, Charlie, because he has a partially collapsed trachea. He needed this harness to prevent frequent coughing. Recently, I found another benefit for my Buddy Belt. Charlie sprained his left front leg and did not want to go for his daily walk. After a couple of days, I knew he wanted to see all his doggie friends. so I used the Buddy Belt like the dog show trainers do. I kept the lead short and walked Charlie right beside me, keeping upward pressure on the belt. His chest, then, bore his weight rather than his front legs. This allowed Charlie to walk without undo pressure on his sprain and enjoy time with his friends until he fully recuperated. This is easily the best harness i have ever had. Functional and attractive. What else do you need?